Baptism By Fire. Plus Over 2000 Advanced Energy Workshops for Physical and Spiritual Evolution. 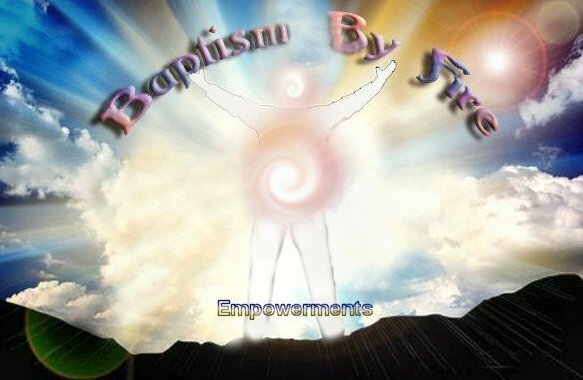 Baptism By Fire Workshop presents a series of powerful Empowerments that is meant to deeply heal, purify and transform. Baptism By Fire Workshop Empowerments will cleanse your bodily tissues of the physiological roots of mental & emotional pain, allowing you to function more efficiently. Baptism means Initiation and Fire refers to the Kundalini experience. So Baptism By Fire (or God) is an esoteric process to bring one to integration at the level of Soul! The 1st level is necessary to purify and cleanse your being of mental and emotional pain! After this has been accomplished and the energies assimilated, you have the option (all levels are complete within themselves & you do not need to take another level) for deeper levels of purification: Baptism Of Fire! As the purification is assmilated by activation of the Empowerments, expanded states of consciousness will unfold as part of your human evolutionary future. We invite you to begin this adventure with us now for: "A Journey of a Thousand Miles Begins with the First Step"! 5 Remarkable Empowerments plus techniques! You will receive the Baptism By Fire Practitioner Manual via Email, All Empowerments, emailed certificate. Plus full email support is given before, during and after all my Workshops.